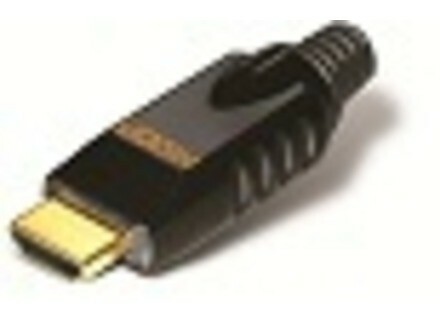 SC-Transit High Speed HDMI Cable with Ethernet, Other Cable/Connector from Sommer Cable. The SC-Transit High Speed HDMI Cable with Ethernet is designed to provide a perfect picture and sound transmission both in the field of professional media technology and in home entertainment. It is particularly suited for laying in cable ducts. As a special feature Sommer have integrated an Ethernet high speed channel to ensure a network data rate of up to 100 Mbit/s. By using a back channel (audio return channel), sound signals from the DVB tuner can be sent directly from the TV to your home cinema A/V receiver and hence to your loudspeakers. The cable consists of 5 x 2 x 0.22 mm² + 4 x 0.22 mm² wires (AWG 24) in a rugged PVC sleeve with an overall diameter of 9.8 mm and has a high-quality triple screen made of a wire mesh + AL/PT foil and a shield wire. It is downward compatible with all former HDMI standards. Compared to the previous HDMI 1.3b standard with a maximum resolution of 2560 x 1600 pixels, the SC-Transit HDMI, combined with the HICON HI-HDMI-M HDMI connector, will transmit a maximum resolution of 3840 x 2160 pixels at 30 Hz – or 4096 x 2160 pixels at 24 Hz. In addition to a cable strain relief and a sleeve support, the compliant HICON HDMI metal soldering connector HI-HDMI-M has a large contact face to achieve optimum damping values and low transfer resistances. With this up-to-date HDMI laying solution you are geared for future generations of Blu-ray players, HD beamers, HD Plasma or HD-(O)-LED-TVs TVs including 3D plus any monitors irrespective of their image refresh rate (100, 200, 600 Hz etc.). For more information, visit www.sommercable.com. Sommer Cable Club Series Tempoflex Sommer have developed a rugged microphone cable, tailor-made for use on stages, theatre boards, musical backdrops and big live events. Sommer Cable Excelsior "Classique I" This cable series has been specifically designed for the demands in the highend sector, according to the company.